Joseph's Grainery: "Is It Organic?" One of the most common questions we receive is, "Are your products organic?" While the whole grains we grow, mill and sell are not certified organic, we do believe that we offer an high quality, all natural alternative to organic that you can feel good about serving your family. Our commitment to sustainability encompasses many different aspects, including a three year crop rotation, never treating the grains with pesticides and offering whole grain products that are free from additives and preservatives. We believe that purchasing whole grain products is far more important than purchasing organic for many reasons, which a whole book could be (and probably has been) written about. In the October 2011 issue of Rachel Ray Everyday, our blogging friend Alex of Ma What's For Dinner was featured in the magazine's Grocery Cart Ambush. 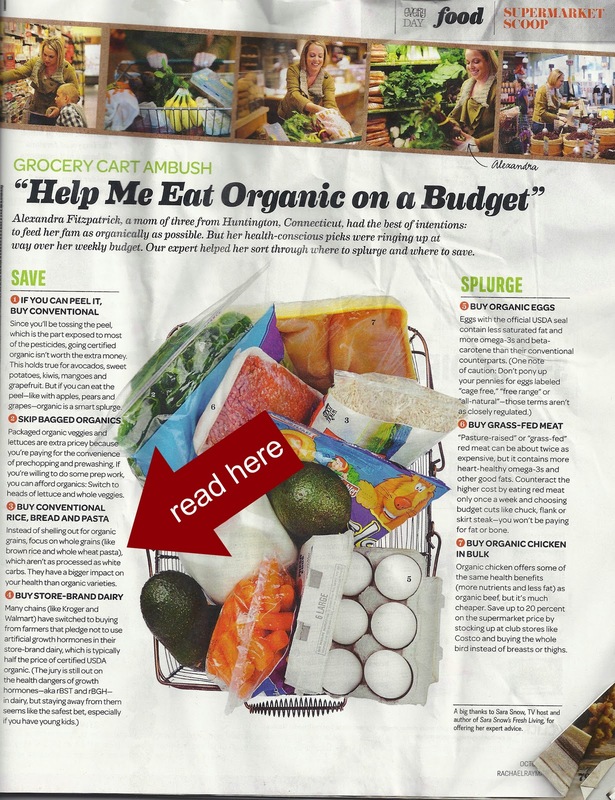 With good intentions, Alex was spending unnecessary grocery dollars by purchasing only organic. "Instead of shelling out for organic grains, focus on whole grains (like brown rice and whole wheat pasta), which aren't as processed as white carbs. The have a bigger impact on your health than organic varieties." With Joseph's Grainery's line of Whole Grain Products you can feel good about serving your family hearty, healthy whole grains that are fresh from the farm and free of any additives or preservatives....a lot more than you can say for many of the items you see on the shelves.